NEW YORK -- Two of the NHL's most intense rivalries will open a new chapter in 2014 by taking the battle outside. Executives and players from all three teams were on hand Thursday when the New York Rangers, New Jersey Devils and New York Islanders -- along with the National Hockey League and NHL Players' Association -- officially announced the details of two January games that will take place in Yankee Stadium as part of the 2014 Coors Light NHL Stadium Series. The twinbill in the Bronx will feature a Sunday afternoon game on Jan. 26, pitting the Devils against the Rangers (12:30 p.m. ET; NBC, CBC), followed by a Jan. 29 night game between the Islanders and Rangers (7:30 p.m. ET; NBCSN). It's the start of a memorable week of sports in the metropolitan area, which will be hosting the Super Bowl at MetLife Stadium in East Rutherford, N.J., on Feb. 2.
followed by a Jan. 29 game against the Islanders. "It's no secret that people have urged us to play at Yankee Stadium since the moment it became clear that our outdoor games were such special, unique and fun events," NHL Commissioner Gary Bettman said at Thursday's press conference. "The creation of the Coors Light NHL Stadium Series allowed us to work within the Yankees' scheduling parameters and, just as important, include all three NHL teams from this area at this spectacular place. "The rivalries between the Rangers, Islanders and Devils are among the most heated in sports. These games in this venue will showcase our players and our sport to a national viewing audience as well as to a variety of visitors who we anticipate will be in the area at that time. I hear a rumor that there is a football game in New Jersey sometime later that week." For the three New York-area franchises, which have combined to win the Stanley Cup eight times since 1980, it will be a monumental doubleheader in the thick of the 2013-14 regular season. The Rangers are the only team to have appeared in an outdoor game previously; they defeated the Philadelphia Flyers 3-2 in the 2012 Bridgestone NHL Winter Classic, which was played at Citizens Bank Park in Philadelphia. "We had the fortunate time of playing against Philly a couple of years ago and I can honestly say it's one of the few events that lives up to the hype," Rangers assistant general manager Jeff Gorton said. "The players loved it, the fans loved it, and to have the opportunity to do it here at Yankee Stadium is just surreal for us and this organization. It should be two great games, and we're looking forward to it." Most of the Devils and Islanders will be playing in their first NHL outdoor games, which have taken off since the Edmonton Oilers played the Montreal Canadiens at Commonwealth Stadium in the Heritage Classic 10 years ago. Both clubs are looking forward to the spectacle of taking on the Rangers at Yankee Stadium in front of tens of thousands of spectators and millions of fans watching at home. "It's a regular-season game, it's an important game. Obviously it's playing against our rivals, that's exciting," Islanders star John Tavares said. "You just really get to experience all the time you've taken to get to the National Hockey League, everything it took. A lot of that for me was playing outside." 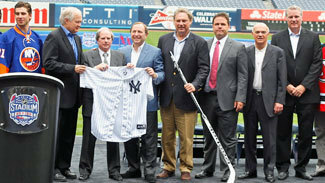 The two Yankee Stadium games will be part of the 2014 Coors Light NHL Stadium Series, which includes outdoor games in Chicago and Los Angeles. In addition, the 2014 Bridgestone Winter Classic will be played Jan. 1 at Michigan Stadium in Ann Arbor, and the 2014 Heritage Classic will take place March 2 at BC Place in Vancouver. The two games at Yankee Stadium will add another chapter to the lore that surrounds one of the most famous sporting venues in the world. 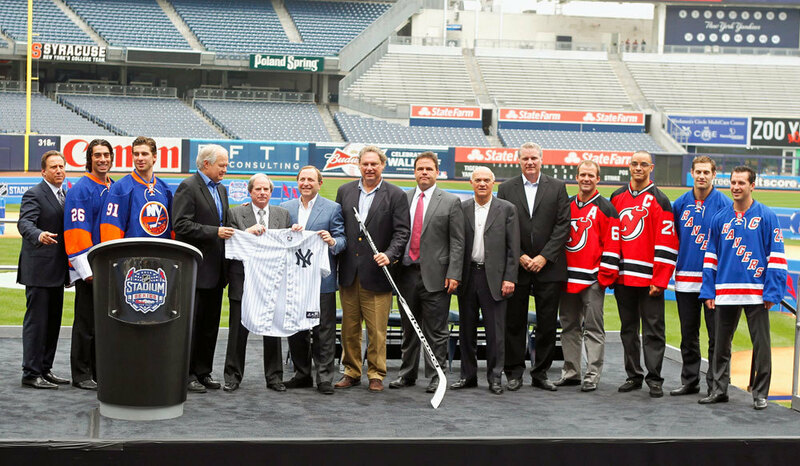 "We are excited to have the National Hockey League, the New York Rangers, the New York Islanders and the New Jersey Devils here at Yankee Stadium. It's a great honor," Yankees president Randy Levine said. "When we built this stadium, one thing 'The Boss' (late Yankees owner George Steinbrenner) insisted was that this has to be the home of the New York Yankees. But he also insisted that this be a place that is utilized year-round. We've done that."